Montreal, Que. December 18, 2009 - Dorel Distribution Canada (DDC) in cooperation with Transport Canada is issuing a voluntary Public Notice of the Safety1st, Eddie Bauer, Cosco and Quinny Designer 22 infant restraints manufactured from January 6, 2008 through April 6, 2009. The infant restraint handle bolt can loosen causing the handle to fully or partially separate from the seat. This may allow the child to fall out of the seat if they are in the seat unharnessed. There have been no reported injuries. Please see remedy below. The Designer 22 Infant Child Restraint is safe for use in a vehicle as it meets and exceeds all crash safety standards put forth by Transport Canada. The infant restraints were sold either separately or as part of a travel system. The stroller portion of the travel system is not affected. 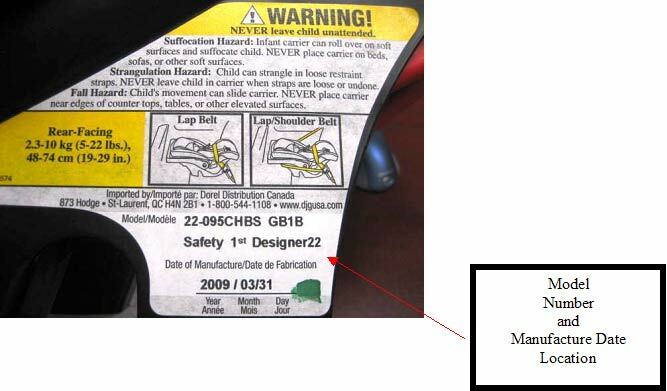 Model numbers and manufacture dates of the infant restraints are printed on a sticker on the side of the infant seat as shown below. Manufacture dates are printed in the YYYY/MM/DD format. Remedy: Consumers can contact Dorel Juvenile Group for a free handle repair kit. Until the repair kit is installed, the seat can continue to be used as directed in their instruction manual but should be carried by the head and foot. Consumer Contact: Consumers should visit the Dorel Juvenile Group website at to verify if their model is included in this voluntary public notice. For additional information, contact Dorel Juvenile Group toll-free at (866) 762 3318 between 8 a.m. and 5 p.m. EST Monday through Friday.